The year 2019 marks the 70th anniversary of the People’s Republic of China, and also the heartbreaking 70 years of the split between Taiwan and mainland China. As the Chinese Ambassador to Sri Lanka, I would like to talk about the cross-Taiwan Strait relations and explain the Taiwan issue to Sri Lankan friends for a better understanding on this core interest of China. For many years, this poem has deeply touched and influenced generations of compatriots on both sides of the Taiwan Strait, connecting all Chinese in hearts and minds, making the dream of national unity as a beacon that lights up our way forward. What is the Taiwan issue? Basically, the Taiwan issue is a question for China to end the status of cross-strait secession and to realise complete national unification. The Taiwan issue is a fundamental issue concerning China’s core interests and the common will of all the Chinese people in the world. Its significance can be explained as follows: Firstly, it is left over from the China’s civil war and is purely China’s internal affairs. Secondly, it is concerning China’s sovereignty and territory integrity, and how China is maintaining her national dignity and fighting against external interventions. Thirdly the basic conflict is between the secession and anti-secession, ‘Taiwan independence’ and unification, ‘One China’ policy and the ‘Two States’ illusion. The Chinese Government in ancient ages has already set up administrations and jurisdiction on this island. From 1624 to 1662, the Dutch and Spanish colonialists invaded the Taiwan Island, but only after a few years they were expelled by the Chinese military and civilians. In 1895 Japan forced the dying Qing Empire to sign the unequal Treaty of Shimonoseki and occupied the Taiwan Island until the end of WWII. In 1943 the Cairo Declaration signed by China, United States and British Governments declared that Japan must unconditionally return the Chinese territories including the Taiwan Island to China. In 1945 the Potsdam Declaration issued by China, United States and British Governments ruled that the contents of the Cairo Declaration must be carried out. In August 1945 Japan surrendered and committed to faithfully fulfil the rules and its obligations in the Potsdam Declaration. On 25 December 1945, the incumbent Kuomintang Government resumed the sovereignty of the Taiwan Island, etc. The split status of the cross-strait will not change the fact that there is only one China in the world, and the legal truth that Taiwan Island is an inalienable part of China. After being defeated by the Communist Party in 1949, part of the Kuomintang administration personnel retreated to Taiwan Island. With support from the United States, they continued to use the designations ‘Republic of China’ and ‘Government of the Republic of China’. But this will not change the fact and the legal status that the Taiwan Island is an inalienable part of China. In the political aspect, since the foundation of the People’s Republic of China in 1949, the Chinese Government upholds and insist that there is only one China in the world, Taiwan is an inalienable part of China, the Government of the P.R.C. is the sole Government representing the whole of China. During the last 40 years, the Kuomintang authority also insists that the Taiwan Island is an unalienable part of China and there is only one China in the world and they firmly opposed the ‘Two States’ and ‘Taiwan independence’ though they refused to admit the legal status of the Government of P.R.C. On 1992, both sides of the cross-strait reached a consensus on the fact that both the Mainland and the Taiwan Island are part of China, both sides should make efforts for the national unification. 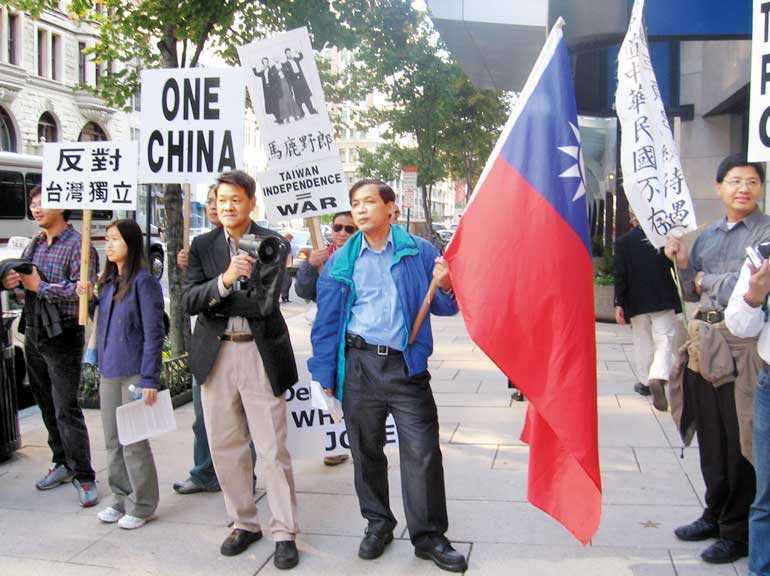 The consensus is well-known as ‘1992 consensus,’ the community of Taiwan always followed the principles of this consensus except for only very small number of ‘Taiwan independence’ forces. In the legal aspect, since the founding of the P.R.C. on 1 October 1949, the Republic of China has lost its dominance in Chinese history and the Central People’s Government of P.R.C. became the sole legal Government of China and the sole Government representing the whole of China. According to the well-established rules and regulations of international laws, the turnover of the regime will not change China’s subject of international law, the Government of P.R.C. certainly has the right to have and exercised the sovereignty of whole China including Taiwan Island. Now, China has established diplomatic relations with 178 countries all over the world including Sri Lanka, all of them acknowledge the principle of One China and commit to handle relations with the Taiwan regime within the framework of the One China policy. During the official visit of Prime Minister Ranil Wickremesinghe on 2016, the Sri Lankan Government reiterated in the Joint Statement that it would continue to stick to the One China policy and would support the efforts of the Chinese Government in safeguarding national unity. In recent decades, China’s development has scored remarkable achievements, people’s living conditions have upgraded dramatically, one-fifth of the world’s population had been lifted from poverty. In 2010, the Chinese economy became the second in the world. In 2018, China’s GDP had exceed 90 trillion RMB (about $ 13.7 trillion), the per capita of GDP is around $ 10,000. In recent years, China contributed 30% of global economic growth and has become an economic powerhouse and anchor of stability. On 2 January, President Xi Jinping’s speech at the 40th anniversary of issuing ‘Message to Compatriots in Taiwan’ has mentioned clearly that the future of Taiwan lies in national unity, the well-being of the compatriots of Taiwan lies in national rejuvenation. China must be and will be reunified. Anyone or any force cannot change the de facto and de jure that Taiwan is part of China, the Mainland and Taiwan Island are all members of the whole China. The historic trend of the rise of China, the national rejuvenation and the national reunification are unstoppable. ‘One country, two systems’ is to ensure the wellbeing of the compatriots of Taiwan, on the basis of considering the reality of the Taiwan’s community and its social system. The concrete accomplishment of the ‘one country, two systems’ will fully consider the reality of Taiwan’s community and its social system, will fully absorb the opinions and suggestions of the people from both sides of the strait and will also fully consider the wellbeing of the compatriots of Taiwan. On the basis of safeguarding national sovereignty, security and development interests, after the peaceful unification, the social system and the lifestyle of the compatriots of Taiwan will be fully respected, the property, religions and legal interests will be fully protected. For 70 years since the foundation of the P.R.C., the Chinese Government has always firmly safeguarded its sovereignty and territory integrity. The compatriots across the Taiwan straits will unite their efforts to defeat any form of ‘two states,’ ‘One China, One Taiwan’ or ‘Taiwan independence’ and win the anti ‘Taiwan independence’ and anti-secession fight. Chinese people should not fight fellow Chinese people. Mainland China will show its utmost sincerity and best efforts to fight for peaceful reunification, because peaceful reunification will benefit the compatriots from both sides of the strait and the whole nation. But we will not create any opportunity for any kind of ‘Taiwan independence’ activities. We make no promise to renounce the use of force and reserve the option of taking all necessary means, but these means are just aimed at the external intervention and a very small number of ‘Taiwan independence’ separatists. The compatriots from both sides of the strait should join together to realise peace, to protect peace and to enjoy peace. The adherence to the ‘One China’ policy is a well-accepted norms of international relations and common understanding of the international community. The Chinese people’s efforts of anti ‘Taiwan independence’ activities and justice to realise national unification are widely supported by the international community, including Sri Lanka. We highly value and appreciate this stand. Chinese domestic affairs should be decided by the Chinese people. We object to any external interference. China’s reunification does not harm any country’s legitimate interests, including their economic interests in Taiwan. It will only bring more development opportunities to other countries, inject positive energy into prosperity and stability of the Asia-Pacific region, and make greater contribution to foster a community with a shared future for mankind, to the peace and development of the world and also to the cause of human progress. I suppose that the Sri Lankan people can understand the meaning of unification, sovereignty and territorial integrity best, as well as the feelings of the Chinese people. It’s our common dream that the nostalgia will be dispersed and national unification will be realised not far ahead.